Financial Crimes investigators have made two arrests in connection with a massive pyramid scheme that allegedly bilked thousands of investors out of tens of millions of dollars. Christopher George Smith, of Toronto, and Rajiv Dixit, of Vancouver, – both 45 years old – were arrested on December 9. They appeared in court a few hours later. It’s alleged that over US$93 million was obtained from thousands of participants of which approximately $45 million was paid out to the early participants. The money was funnelled to accounts in Belize, St. Lucia and other countries. At a press conference at police headquarters on December 9, Detective Sergeant Ian Nichol said the Service’s Financial Crimes officers started the investigation in January 2013. 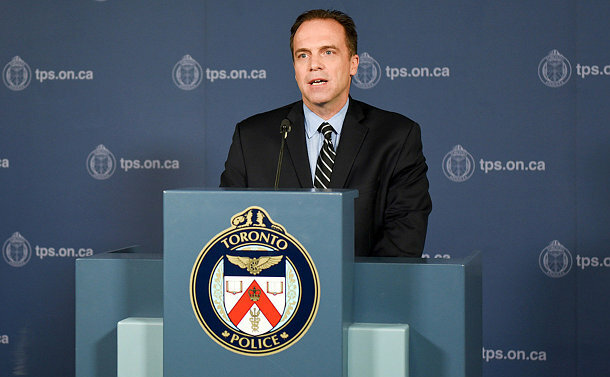 He said allegations are that between October 2010 and 2013, the accused operated the scheme, known as Banners Broker, out of a Church St. address in Toronto. Nichols said police are alleging that new investors were drawn to the scheme by way of a series of false and misleading representation. “They were duped into believing they were advertising in an internet advertising business, a legitimate business,” he said. “In fact, no actual product was generated. There were steps that were taken to give that appearance. Nichols added that thousands of participants worldwide participated in the illegal scheme. Dixit and Smith were charged with defrauding the public, possession of proceeds of crime, laundering the proceeds of crime, operating a pyramid scheme and making false or misleading representations.